The sitter was the sixth child and eldest son of the 1st Earl Cornwallis. In 1776 he sailed for America, in comand of seven regiments of infantry, to reinforce the English Army there. He displayed considerable military ability and achieved many notable successes during the American war of Independence, before being finally defeated and forced to surrender at Yorktown on 19 October 1781. 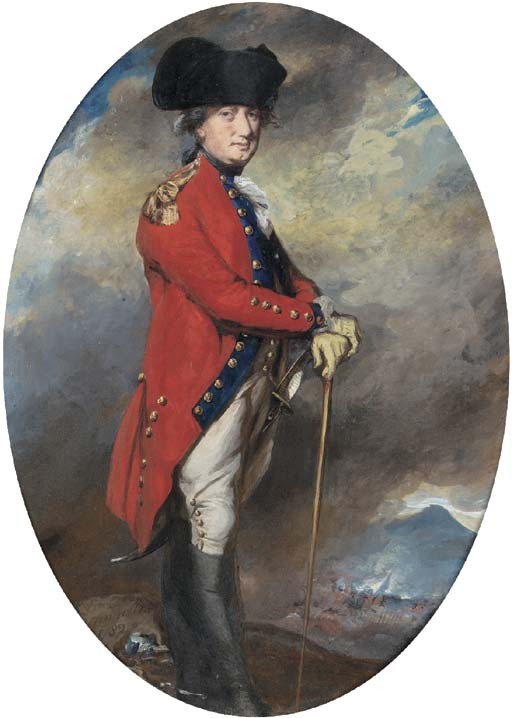 He went on to become Govenor-General and Commander-in-Chief in India from 1786 until 1793, during which time he was created Marquis Cornwallis in 1792. He was Viceroy and Commander-in-Chief in Ireland from 1798 to 1801. During a return trip to India in 1805 for peace negotiations with Scindia and Holkar he was taken ill and died on the 5th October aged sixty-six. Two other portraits of the 1st Marquis Cornwallis by Daniel Gardner exist, one full-length, was with Agnew's; another three-quarter-length was sold Christie's, London, 28th November 2000, lot 23 (£19,975). There is also a portrait by Thomas Gainsborough, R.A. in the National Portrait Gallery, London.